17*14 inches length, 0.20mm thickness,extra PTFE layers. 600 DEGREE Peak Temperature | Heavy Duty Non Stick BBQ Grill Mat allows you to cook like a chef, leaving perfect grill marks and preventing even the smallest morsels from falling through the grates. 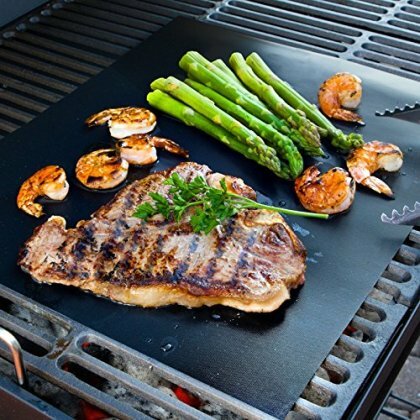 These flexible mats retain heat in the same fashion as a grill stone or grill plate, yet are easier to use. Cooking mats are made of heat-resistant technologically advanced materials, similar material to non stick cookware which will not burn. EZ Wipe Clean | Dishwasher Safe! SHIPS FROM USA | Sold Only by AURA.